This was another record-breaking year in the Pilbara with both quarterly and full year iron ore production. Record global iron ore shipments of 239 million tonnes in 2011 were below production due to extreme weather conditions experienced in the first half of the year. Despite this, Rio Tinto’s Pilbara ports operated at above annualised capacity rates and shipped record volumes of 61 million tonnes in the fourth quarter and 225 million tonnes for the full year. 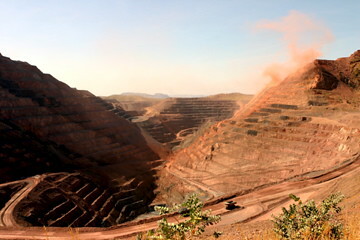 While scheduled maintenance, tie-in activities and the wet season in the Pilbara are expected to affect Western Australia Iron Ore production in the second half of the 2012 financial year, full year production is now forecast to marginally exceed prior guidance of 159 million tonnes per annum. Vale proposed a minimum dividend of $6bln for the year, an increase of over 50% versus the previous year’s minimum payment and in line with the actual dividend payment over 2011. Rio Tinto and BHP Billiton continue to build capacity in the Pibara iron ore district. With relatively low mining costs and close proximity to the Asian/Chinese market this iron ore region is the most competitive (and largest) producer in the world. As the output in Pilbara is exceeding expectations and Chinese growth is slowing, exporters in other regions face an uncertain future. The global iron ore market is slowly evolving to a scenario where Brazil and Western Africa supply ore for the European market and the Latin American growth market, and Australia supplies iron ore for Asia. Vale’s increase of dividends fits in the trend of recent dividend increases in the industry and is a clear sign of uncertainty in the boardrooms of many companies: organic investment opportunities and development capacity are limited, share buybacks and cash takeovers would increase leverage and vulnerability, and with the uncertainty about future economic developments many companies decide to give the cash to shareholders in an attempt to keep share price high.